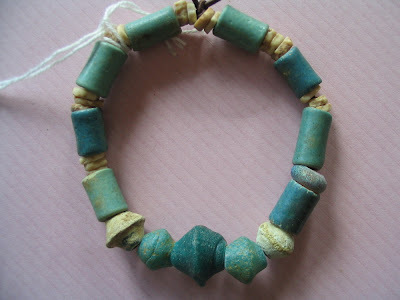 This is one of my favourite bracelets, made up of ancient glass and faience beads from China's Xizhou Dynasty (1027-771 BC) Beads are cylindrical as well as biconical shape with small white disc shell beads. Teal colour some nearer to turquoise colour. The cylindrical beads are of faience while the biconicals are of glass. 2 of the biconical beads have undergone a "sea change" with the blue turning whitish, possibly as a result of decomposition of the glass due to long burial. Beads purchased as a longer strand from Sichuan province and broken up into various projects. These over 2000 year old beads, really give me a pang ! I hardly dare to use this bracelet as it is so fragile and breakable. Hmmm....perhaps the biconical beads would be better as a earring dangle ! On second thoughts, maybe not such a good idea as it would mean putting wire and hooks through these lovely and brittle beads.